It seems that “Peak Week” should happen early new week on the Manistee River. Salmon are beginning to hit the gravel big time. Each morning there have been a bunch of new redds. Most of the Chinook salmon are in the pre-spawn mode but moving quickly to spawning. We had a decent rain over the weekend. Water levels are up slightly, making for some good fishing. This should bring in more salmon, and a good number of Steelhead. For those of you seeking chrome, new fish have been moving in daily. Decent numbers of Steelhead can be found in the mid section on the Manistee. Bear Creek to Rainbow Bend has been fishing well. Larger Steelhead should be coming soon as river conditons are perfect. 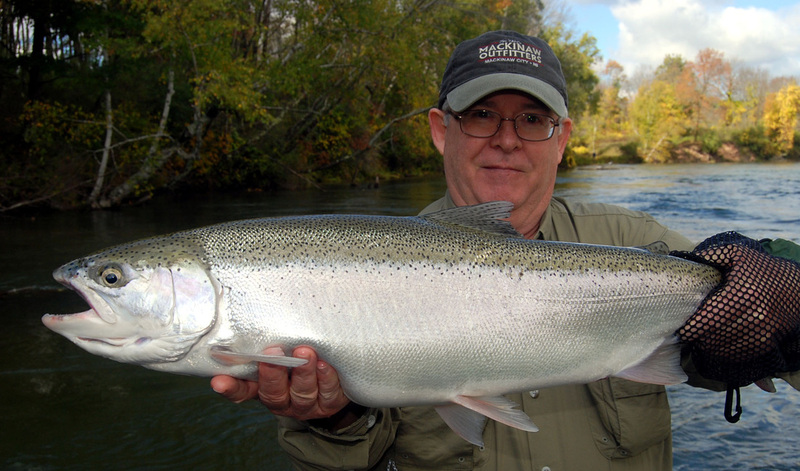 Chuck with a gorgeous Manistee River Steelhead. The Muskegon River is just a bit behind. Salmon are just beginning to spawn around Thornapple up to Pine st. Both trout and salmon fishing has been good. Steelhead should show up in decent numbers in mid October. We still have a few open dates left for Manistee River Salmon, and a handful of November dates for Steelhead. Special Salmon Fishing Rates for the lower Pere Marquette River and Big Manistee River. Things are finally beginning to look up. The Pere Marquette and Manistee are both reporting some fish starting to show up. The Big Manistee has a fair amount of Kings in the middle section, Bear Creek – Rainbow Bend area. Thunder sticks and skein producing the most fish. By no means is this a phenominal run of salmon, there is a fishable, adequate number of fish so far, and certainly nothing like the incredible run of 2013. Over the next few days, look for salmon beginning to make the transition from deep holding pools to polishing gravel. Recent rains and a water level bump are sure to shuffle the deck, move fish up the river, and get salmon in the mood to dig gravel. Check expectation at the door! This is turning out to be nothing like the run last year where you could ‘Walk across the river on salmon”. This is a year you’re going to have to work for your fish, and do things right to get them in the net. Should separate the men from the boys, so to speak. On the bright side, there should be enough salmon for everyone to have fun with. There’s also a few Coho on both rivers, especially the Manistee. Skamania numbers were up this year along with plenty of healthy resident trout. Fall Steelhead may also be abundant this fall since we’ve had a lot of rain, higher water levels this year. After a very bleak and dismal weekend on the Pere Marquette River, we decided something new was in order. The PM had been fishing well all week, come the weekend, salmon bites were scarce and nowhere to be found. The Pere Marquette had minimal fish over the weekend. Boat traffic or recent rains had the salmon either lock jawed or headed further up river. The end result was poor fishing over the week. Today is a new day. We traveled north to the Big Manistee River. We were pleasantly surprised to see clear water and a fair number of King salmon behind each log jam. Casting fire tiger thundersticks had a bright hen in the net within the first few minutes. Several more followed in quick succession. The Manistee seems to be producing much more action, and consistent fishing. Floating skein or casting crank baits all produced nice fish today. Things are looking up for salmon on the Middle to lower sections. Rainbow Bend down to the Manistee lake train trussle, all producing a decent number of fish. With higher lake levels, the Manistee has been getting great pushes the last several days. It seems a ghost town from High Bridge up to Tippy. The upper sections have been very slow lately with only a handful in the upper two miles. Tippy is slow right but expect it to be fishing great early next week. We had a decent amount of rain so that should get them moving from them middle sections, towards the dam, We’re sincerely looking forward to decent number!! Way cooler tempratures in the 50’s, perfect salmon weather! The last several mornings have had decent action from casting thunder sticks, with new pushes of fish coming in from the lake, now daily with cooler nights. Salmon from all stages of the game, chromers, caramel, and darkies all headed towards the upper river. Indian Bridge has had good numbers of fish pushing through and beginning to load holes. We are planning on guiding the Pere Marquette for another week or so, then headed to the Manistee to chase brighter fish all over again. Hopefully cooler nights and decent rain is going to get the main push moving in a big way. It definitely won’t be long now! The big three rivers are all now starting to have fishable numbers of salmon with an occasional Coho or Lake Run Brown Trout being caught. Casting crank baits is an equal opportunity fish catcher for sure. We are certainly looking forward to a great Fall! King Salmon that devoured a Thunder stick! Salmon fishing has been very good the past several days! Great numbers of fish in a pocket today, and gone the next. Pockets of salmon throughout the Manistee and Pere Marquette River. Casting Thunder sticks still remains the most productive method for now. Skein bite should turn on with some cooler temperatures. There seems to be a fair number of salmon entering the rivers each morning. Numbers should increase with some rain and cooler nights. River levels are perfect for a good migration this year! We now have 7 full time salmon guides available this fall for the Manistee & Pere Marquette River. We will be returning to the Muskegon River for Fall Steelhead beginning October 20th. Over the past few days, salmon fishing on the lower Pere Marquette River has been outstanding! Hard east winds have brought in a big early push of bright silver chromers into the river. All of the lower sections below Indian Bridge have been fishing well. Mornings have been exceptionally good. It should become one of the best years on record for salmon. Fish seem healthy and in good numbers so far this year! Looking for plenty more to get it cranked up! Michigan Salmon Fishing Trips. Selection of the best colors on Thunderstick crankbaits for early king salmon. Bright colors catch fish! Casting Thunder sticks has been the name of the game. Casting lures in and around deep water log jams has been producing violent head shakes, and big tank Chinook salmon!! Whoo Hoo King season is upon us and salmon are a little earlier this season! Colder than average summer temperatures have made for cooler river temperatures bringing in salmon early. This should bode for great fishing during the rest of the season. Higher water levels make for easier migration into the upper sections this year. Easier swimming makes for faster migration. Salmon numbers are up this year along with larger sized fish. If you fished with us last year, hang on to your rods, and bust out the 9 or 10 weight fly rods or heavier spinning rods. Salmon are going to be BIG this year!! Big chrome kings absolutely crush brightly colored deep junior thunder sticks! Heart stopping hits, huge head thrashing shakes, and BIG salmon in the net!